Known as a surfers beach. There is good surf, but also can be strong undertows and swift currents. Surfing lessons are available. The beach is fun, great waves. I need to build up the confidence to try a surfing lesson! 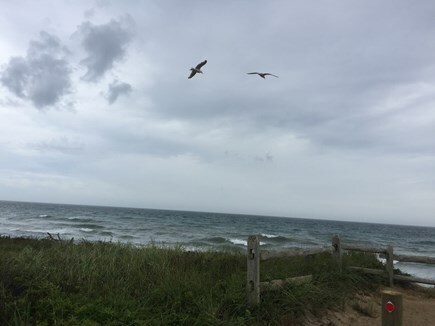 Beautiful beach with waves on the Atlantic Ocean side of Nantucket-popular with surfers, skim boarders, and boogie borders--or folks who just love to wade in and enjoy the refreshing feeling. You can even rent boards or lessons--and wet suits, too, if needed. This beach has life guards--and new for 2013--a very nice Bike Trail that runs from Main Street downtown-plus a newly configured larger parking lot with additional portable toilets available. From parking lot to beach is a short distance--on the way back from your day in the sun stop off at Cisco Brewers of Bartlett's Farm Market.